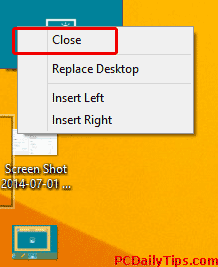 Today Windows 8.1 quick tip is to completely closing programs on Windows 8.1 which can actually done by many ways. Thing is, even these apps or programs are closed or disappear from your screen, with some of these methods, these programs are still running in the system’s background. I used to think, okay, the program is closed, and didn’t check the Task Manager. You can view what programs are still running in your Task Manager. Closing programs on Windows 8.1, can result the programs still run, however it has advantage. One big advantage I notice is that, when you re-open the program again, it will immediately open the app windows in no time or no delay. 1. The standard or older version X close button on the top right of the app windows. 2. Hover the app icon on your task bar, and you’ll see the close small red button, click it. 3. Still on the task bar area, right click the running program icons, select and click the “Close window” button. 4. Hover your mouse on the left top area of your desktop screen, you will see the running programs on your PC, and right click each icons and click “Close”. These methods, will close or make your apps windows disappeared, however, when you open your Task Manager (right click start screen, select, “Task Manager”) you’ll see the apps are still running, and eating your RAM. To do this, you will have two ways that I know of. 1. Using keyboard shortcut keys, while the app window opened, press your ALT + F4 keys combination, and the app will be gone completely. 2. My favorite method, while the window open, put your mouse’s cursor on the top middle of your computer screen, hold and drag it to the bottom of your screen, wait until the app icon flipped, (usually takes a few seconds) and release the mouse. That’s how I find how we can close the apps on Windows 8 completely. If you know any other methods, please leave comment below.